The first moment that I stepped foot onto the University of California, Santa Barbara campus was orientation, months after I received my acceptance letter — not knowing what UCSB was going to be like or what it even looked like. During those few days of orientation and throughout my entire freshman year, countless seniors advised me that college goes by faster than they could have imagined. Now as a senior, I finally see what they mean. The vital piece of advice that I would give to new students is to take your time and to take it easy. It might sound like an obvious statement, but it is underestimated. Through all the all-nighters and Project-X-esque Saturday nights, it is important to recognize the difference between going through the motions and experiencing student life. One of the first things that you may be given in the freshman UCSB packet is a bucket list with leisurely things to do like climbing Storke Tower. I tried to excuse myself from participating in the undie run when it was winter or fall since it would be too cold, or watching a Gaucho soccer game because I’m not about sports — but don’t be a slacker like me. Through all the time here, take advantage of what you can do in a place like this and maybe even make your own bucket list. UCSB is such a distinct college town. It is essential to get to know not only what the UCSB environment has to offer but Isla Vista and Santa Barbara too, throughout the four years. As great as all of these things are, Freebirds is not the only restaurant in I.V., Campus Point is not the only gorgeous view and Super Smash Bros. is not the only pastime available. Living in the dorms can lead to a seclusive and sedentary freshman year. At the same time, that kind of setting can provide so many opportunities to meet people and can also offer excuses to get out of the claustrophobic-inducing dorm rooms. Often, for things to happen, you need to get yourself out of your dorm room. Furthermore, joining as many interesting clubs or organizations as possible is cultivating toward a college experience. That sentiment is always thrown around often, but it is a great way to get to know people or to develop a passion. Tinder is not the only way to meet people. Apart from Greek life, UCSB offers so many niche clubs and organizations that range from the UCSB Hip Hop Collective to the Cotillion Dance Club. It is almost impossible to not find a place to fit in within a school of over 23,000 undergraduates. UCSB is not only diverse when it comes to people but also when it comes to majors and minors. Our general education system allows students to try out different subjects, and that can be very opportunistic. In the same vein, it is vital to keep an open mind about career pursuits. No one expects someone fresh out of high school to know what they want to do for the rest of their life, so coming in as undeclared or switching your major at least once is just part of the process. There are small initiatives that can take a student far, when it comes to academics. Taking great notes and talking to professors and teaching assistants are actions that are often underrated, and can apply to any class. But the academic environment paired with a casual existential crisis can also be stress inducing. 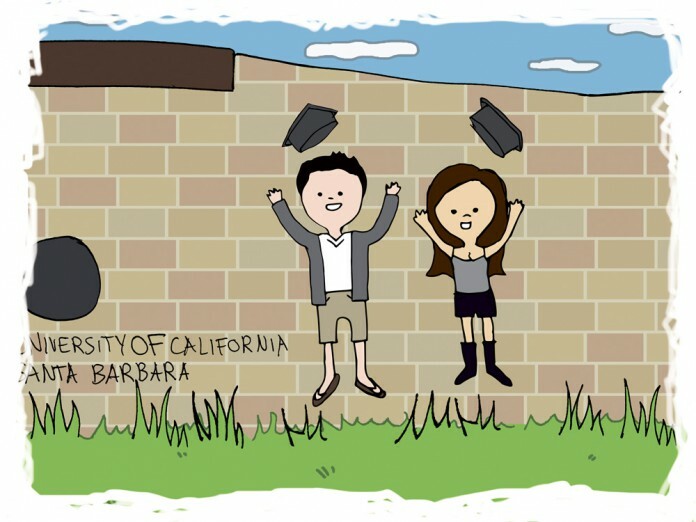 UCSB’s quarter system can feel fast paced and it might be a hard transition from high school. There will be moments where you will think that that wearing pajamas to class is not such a bad idea or you eat instant noodles for days, and that’s okay. Finding ways to unwind and people to go to are all helpful. At the risk of sounding like a parent, it is important to have fun, but to not forget about academics. You may have heard the running joke that you can only choose two of three things: good grades, social life and enough sleep. This running joke isn’t necessarily true. There’s always coffee, and there’s always time — as long as you use it right.